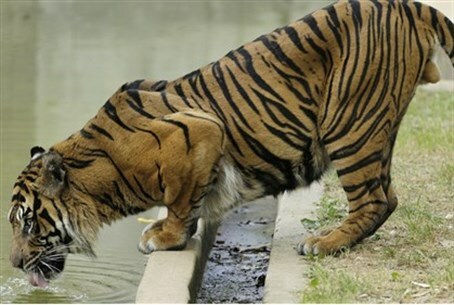 A "maneater" tiger hunting for food in northern India has killed seven people in the past two weeks, according to local wildlife authorities. In response, thousands of villagers have locked themselves in their homes while armed hunters try to put the raging animal down. Rupak De, the Principal Chief Conservator of Forests, told Fox News Wednesday that the female tiger has been sighted in an area stretching over a length of 80 miles (130 kilometers). The latest victim of the prowling tiger was a woman who was found mauled to death Tuesday in a forest in Uttar Pradesh state, a region bordering Nepal in India's north. The tigress's killing spree began December 26. Last Wednesday, when the tiger's kill count was at 5, De declared it a "maneater," noting "it has been attacking only humans. Conservation of wildlife being people dependent, we cannot allow more losses of human lives. We are now in search of sharpshooters who can kill the tigress." Bengal tigers, 200 of which are kept at the Jim Corbett National Park from where the maneater is thought to have come, are an endangered species, with fewer than 2,500 accounted for worldwide. Meanwhile, wildlife activist and member of Parliament Meneka Gandhi asked Uttar Pradesh's government not to shoot the lethal tiger, claiming the big cat was only attacking people out of hunger, and would stop after returning to its natural habitat. Gandhi urged the local government to capture the tiger and release it in the neighboring state of Uttarakhand, reports ABC News.